In Model Drawing, we draw boxes to represent numbers. We can take the idea further by using symbols instead of boxes. The concept is based on algebraic thinking and will make it easier for young students to understand Algebra in later years. Let's look at a few worked examples. The cost of a pencil is two-fifths that of a pen. 5 pencils and 4 pens cost $6. What is the cost of 1 pen? This question involves fractions. In Drawing Models, we think of fractions in terms of units. 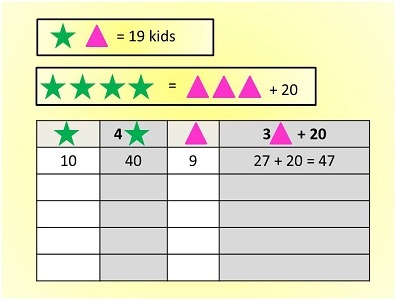 In Using Symbols, we draw pictures such as triangles, stars or anything that is easy to draw. 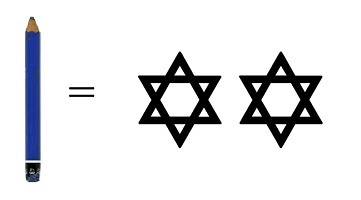 I'm going to draw stars for this example. The cost of a pencil is two-fifths that of a pen means that the cost of a pencil is 2 parts and the cost of a pen is 5 parts. (Two-fifths means 2 out of 5). Now I can find out the cost of 5 pencils and 4 pens in terms of stars. I also know that the total cost of 4 pens and 5 pencils is $6. To make it easier for me to calculate, I change the $6 into 600 cents. 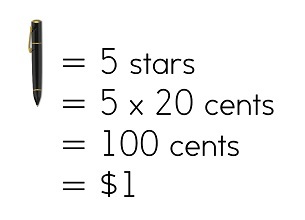 Now I use division to find the cost represented by 1 star. Remember that the cost of 1 pen is equivalent to 5 stars. The cost of 1 pen is $1. Bryan invited 20 more boys than girls to a party. 3/4 of the boys and 2/3 of the girls came. 19 kids didn’t come. How many kids did he invite? This question is hard to solve because there seems to be too little information. We don't know the total number of boys or the total number of girls so it's hard to make use of the fractions. We have to think of this in another way. 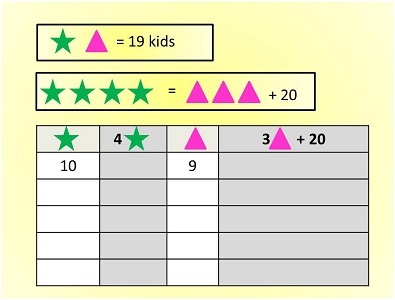 I am going to use stars to represent boys and triangles to represent girls so it's easier to understand. The phrase '3/4 of the boys' tells me that the total number of boys that were invited can be grouped into 4 groups. 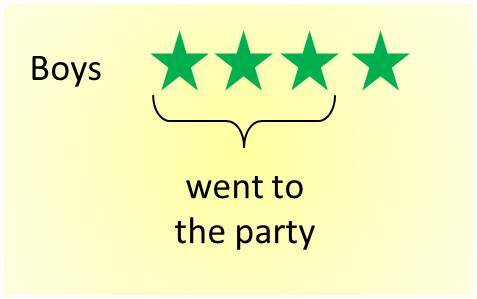 3 groups attended the party and 1 group did not. 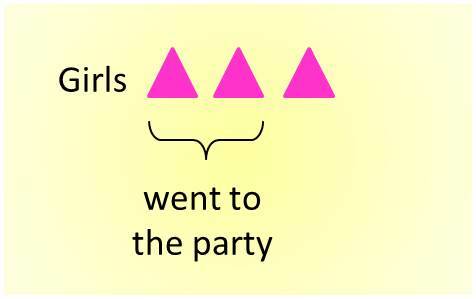 Similary, the number of girls invited to the party are grouped into 3 groups. 2 groups attended and 1 group did not. Since 19 kids did not attend the party, 1 group of boys plus 1 group of girls equals 19 kids. We also know there are 20 more boys who were invited than girls who were invited. In other words, if we add 20 girls to the 3 groups of girls we will have the same number of boys and girls. I start by drawing a table with 4 columns. The first column is the number of boys in one group and the third column is the number of girls in one group. Keeping in mind the first condition, these 2 numbers must total up to 19. The second column is the total number of boys (4 groups of boys). The fourth column is the total number of girls (3 groups of girls) plus 20 more. According to the second condition, columns 2 and 4 must have the same answer. Next I fill in columns 2 and 4. According to the second condition, these 2 numbers must be the same. Since column 2 has the number 40 and column 4 has the number 47, this means that my choice of 10 boys and 9 girls is wrong. Now when I fill in columns 2 and 4, I will get the same number! 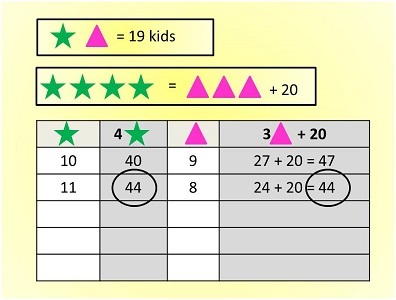 This means that each group of boys has 11 boys and each group of girls has 8 girls. Bryan invited 4 groups of boys, which works out to 44 boys. He also invited 3 groups of girls, which works out to 24 girls. There are 20 more boys than girls so this condition is also fulfilled. Bryan invited 68 kids to his party.